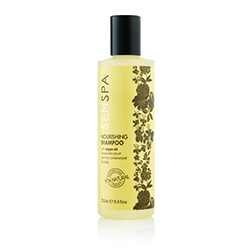 SenSpa Nourishing Shampoo combines vitamin rich Argan oil, hibiscus and baobab extracts with a comforting blend of jasmine, Cedarwood and Ylang pure essential oil. The main ingredient of the nourishing shampoo is a specialist Argan oil for hair, which is widely recognised as a miracle oil. Argan oil benefits include the ability to deeply penetrate hair to help restore strength and nourish dry hair to silky softness. This gentle shampoo is the best shampoo for dry hair due to it's combination of argan oil and carefully selected blends of protein flower and fruit extracts to help strengthen hair by locking in moisture. Your hair will be left cleansed, revitalised and luxuriously soft and shiny. Use the SenSpa Nourishing Shampoo and follow with the SenSpa Nourishing Conditioner from the SenSpa range of hair products to benefit from softer, stronger hair all day long. SenSpa's products are not tested on animals and are free from animal ingredients, Parabens, Sodium Lauryl Sulfate and Mineral Oil. Directions: gently massage shampoo into wet hair into a rich lather. Rinse thoroughly and repeat if necessary. For best results, follow with SenSpa Nourishing Conditioner. Ingredients: Aqua (Water), Cocamidopropyl Betaine, Sodium Lauroyl Methyl Isethionate, Glycerin, Sodium Chloride, Polyglyceryl-4 Caprate, Sodium Lauroyl Sarcosinate, Sodium Benzoate, Hydroxypropyl Oxidized starch PG-Trimonium Chloride, Panthenol, Hydrolyzed Wheat Protein, Starch Hydroxypropyltrimonium Chloride, Potassium Sorbate, Trisodium Ethylenediamine Disuccinate, Cocos Nucifera (Coconut) Oil, Citric Acid, Citrus Aurantium Dulcis (Orange) Peel Oil Expressed, Argan Oil Glycereth-8 Esters, Lactic Acid, Sodium Lactate, Urea, Cymbopogon Martini Oil, Juniperus Mexicana Wood Oil, Sodium Phytate, Cananga Odorata Flower Oil, Cinnamomum Camphora Linalooliferum Wood Oil, Pogostemon Cablin Leaf Oil, Levulinic Acid, p-Anisic Acid, Pelargonium Graveolens Oil, Hibiscus Sabdariffa Flower Extract, Kigelia Africana Fruit Extract, Bulnesia Sarmientoi Wood Oil, Adansonia Digitata Fruit Extract, Argania Spinosa Kernel Extract, Anthemis Nobilis Flower Oil, Citrus Aurantium Dulcis (Orange) Oil, Mentha Arvensis Herb Oil, Styrax Benzoin Resin Extract, Vitis Vinifera (Grape) Seed Oil, Alcohol, Eugenia Caryophyllus (Clove) Bud Oil, Jasminum Officinale (Jasmine) Flower Oil, Rosa Damascena Flower Extract, Dehydroacetic Acid, Geraniol, Limonene, Linalool. Recycling Information: Please note that the bottle and cap are recyclable.